The classic game of dungeon adventure. 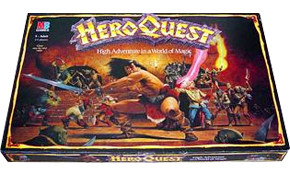 Every geek of a certain generation will remember playing Heroquest as a kid; it is still the classic dungeoncrawl game. In a smart business move, Games Workshop partnered with mainstream games giant Milton Bradley to release this hugely successful game in 1989. Several expansion sets followed which all command high prices on Ebay (and there are different versions depending on where the game was published), and people still play, enjoy and collect this classic game. It certainly helped that it came with a spectacular range of plastic figures (even pieces of model furniture) and fantastic artwork for the time, but the game system itself is simple enough to be enjoyed by all ages. It also brought a bit of a roleplaying element back into the mix by having one player act as ‘Morcar’, the evil wizard who controls the dungeon and its monsters—in effect, he is the D&D ‘Dungeon Master’. Heroquest brought a lot of D&D players their first taste of the boardgame hobby—and it’s still a fantastic game to get young players into boardgaming. It’s the grandaddy of dungeoncrawls, it’s basic, it’s not much more than a toy, but it positively bursts with nostalgia. It’s Heroquest. Hardly needs a summary, but I’m a completist, so here you go. Now go introduce your young nephew to gaming.